The tortoise feed growing kit is a complete kit for growing edible weeds for Mediterranean tortoises. The kit contains: Edible weed seeds - enough for 4 sowings, seed trays, propagator top, compost and full instructions. Mediterranean type tortoises such as Hermann's Tortoise (Testudo hermanni), Matginated Tortoise (T.marginata), Greek Spur-thighed Tortoise (T. graeca) and Horsfield's Tortoise (T. horsfieldi) all make great pets but they do have some exacting dietary needs. In the wild they would range over a large area, grazing almost exclusively on the leaves of annual and perennial plants that grow in their habitat, a diet that is typically high in fibre but very low in proteins and carbohydrates. This can be hard to replicate in captivity. Most shop bought salad is low in roughage and can be nutritionally poor, while collecting wild weeds can be time consuming and at certain times of the year difficult. You can never be sure that they are free of insecticides, herbicides or other contaminants such as lead from exhaust fumes, or even that you have identified them correctly and have not collected something poisonous. The wild seed mix contained in the ProRep feed growing kit has been developed after many years of careful observation of wild tortoises and their food plants. The select mix of annual and perennial plants has been grown specifically for the tortoise feed kit and has not been 'padded out' with cheap grass seed that Mediterranean tortoises do not readily eat. 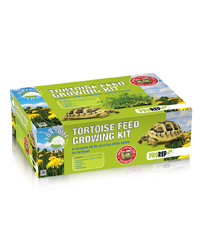 This kit can be used all year round to provide a source of nutritious, weed leaves that allow tortoises to graze naturally and obtain a wide range of nutrients essential for slow, healthy growth. The trays are placed in the tortoise enclosure or the leaves harvested to mix with other food and avoid the use of unsuitable shop bought greens. Harvested trays will re-grow for multiple use. Looks good and the seeds started to grow almost immediately. They are coming on well. Only one small pack of seeds came with the kit a couple of packs would have been better for the price. Blue Lizard Reptiles reply: The kit should come with enough seeds for 4 sewings. The seeds are then available seperately, so you do not have to keep buying the full kit.